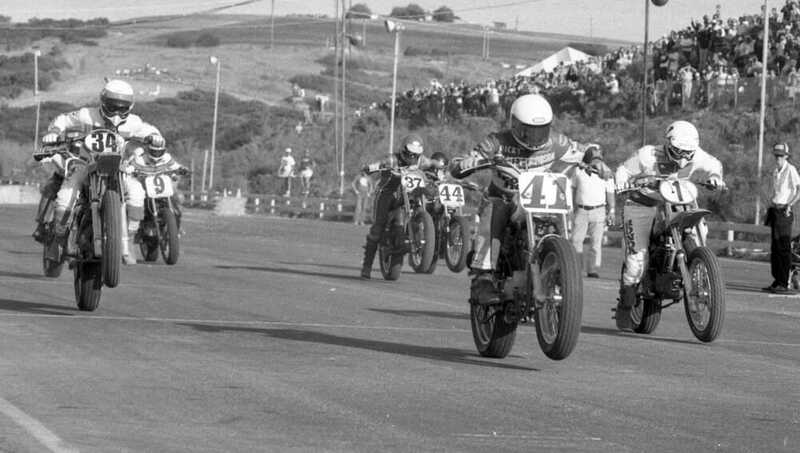 This week’s Throwback Thursday photograph takes us back 34 years ago to the 1982 ABC Wide World of Sports Superbikers, the completion that pitted riders from various racing disciplines to race on a track built at Carlsbad (Calif.) Raceway with elements of road race, motocross and flat track. 1982 was the fourth edition of the popular made-for-TV competition dreamed up by race promoters Gavin Trippe and Bruce Cox, which later spawned Supermoto racing. At this particular race it was the Harley-Davidson XR750s ridden by flat trackers Ricky Graham (No. 41) and Jay Springsteen (No. 9) who battled with motocrossers Steve Wise (No. 1) and Danny “Magoo” Chandler (No. 34) in the early going. But as the race wore on the effort of riding the big XR750s through the motocross sections wore on Graham and Springer and they fell back leaving Wise and Magoo to battle it out. In the closing laps Wise (who won the race the year before) nailed a hay bale with his Honda allowing Chandler (on a specially built Honda CR480) to get a gap that he held to the finish. Wise finished second and Springsteen third. Also visible in the photo are Superbike racer Thad Wolff (37) and flat tracker Alex Jorgensen (No. 44).